We want to make the buying and selling of digital assets as simple as possible – and as accessible as possible. We want people with minimal technical experience to be able to interact with our platform and experience the power and freedom of cryptocurrencies. “Our vision is to become the number one peer-to-peer cryptocurrency services group globally. Banking the unbanked, the gateway to global cryptocurrency investing: Despite the rapid growth of cryptocurrencies, there are 2 billion adults worldwide without access to banking services. To invest in cryptocurrencies, investors must have some form of access to banking, whether that be a bank account, credit card or debit card. We require no bank account to use our platform, users can buy and sell using over 20 payment methods. Existing cryptocurrency exchanges are far too complicated: As a result, the industry has high entry barrier which is restricting the masses from investing in the cryptocurrency eco-system. We have designed and built an exceptionally simple platform, which is easy to use, dynamic, responsive and user friendly resulting in mass appeal and adoption. The increasing problem of centralisation: All major cryptocurrency exchanges are centralised, meaning the majority of people buying and selling are purchasing decentralised cryptocurrencies and tokens from centralised exchanges. This needs to change, the birth of blockchain and cryptocurrencies were born to eradicate centralisation and introduce more decentralised institutions. Users that wish to sell their cryptocurrencies back into cash usually experience various issues, from payment delays to high fees. We’ve simplified the process and removed all unnecessary fees. We’ve abolished the above by allowing users to trade (buy/sell) with each other, users are notified of which users that are online and matched with users wishing to take the other side of the trade, resulting in instantaneous settlements. We’re Banking the unbanked and opening doors: Despite the rapid growth of cryptocurrencies, there are 2 billion adults worldwide without access to banking services. To invest in cryptocurrencies or digital assets, investors must have some form of access to banking, whether that be a bank account, credit card or debit card. 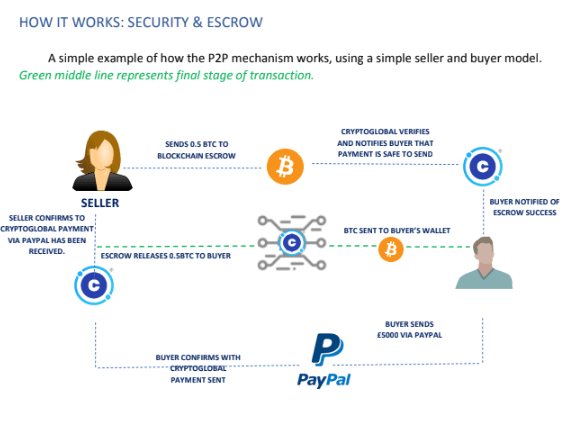 CryptoGlobal Marketplace opens the door for the unbanked population and the banked population to buy/sell cryptocurrencies using traditional and alternative payment methods such online wallets, and money transfer agents, among many others. We’ve integrated over 20 payment and withdrawal methods to help alleviate this issue. We’ve stripped down the exchange to it’s core: Exisisitng cryptocurrency exchanges are far too complicated. As a result, we’ve designed and built a clean, intuitive, responsive and easy to use platform. A platform that any investor, at any age, with any education level can easily transact on. Idea is Born. The idea of the CryptoGlobal Marketplace was born. Development Begins. The idea is validated, the team assembled. We begin validation to bring this idea to life. 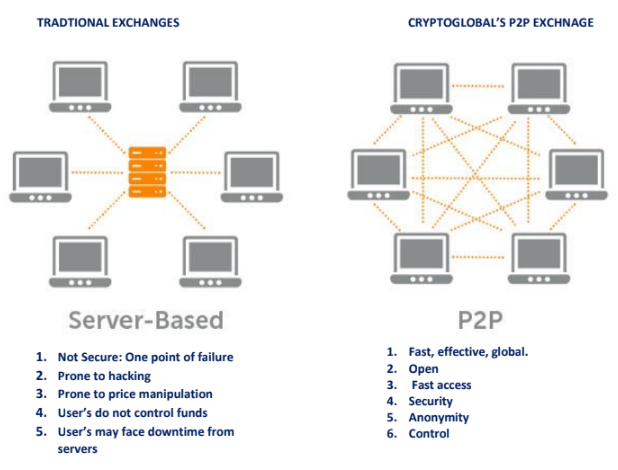 Development completes and we launch our next-gen P2P decentralised exchange. Token Sale Planning/Community Building. We begin to gather information, resources and partnerships in order to plan effectively and efficiently for our token sale to the community. Pre & Main Token Sale. We'll be giving investors the opportunity to invest in a long-term sustainable business for the future, by allowing the purchase of "CGX" tokens. Tokens will be distributed accordingly and listed on tier 1 global exchanges. Development of our Android and Apple app store app begins. Allowing users globally to trade digital assets on the go. We open doors to selected partners to advertise text ads in selected locations on our platform. Opening up another revenue stream. We develop and launch our crypto-fiat debit cards, allowing users to spend without selling their crypto assets. We begin to integrate popular cryptocurrencies and alt0coins, based on our community choice. This will increase choice and trading options for all of our user globally. Our year of expansion in various regions continue as we embark on our journey to onboard more people and equal the playing field. Integrate smart contracts technology throughout the platform, to streamline transactions and processes.